Good Morning & Happy Friday Everyone! Another quick post for you all today! This card is actually my September Thank You to my wonderful friends that place orders this month!! I do appreciate you choosing me as your SU! demo & this is just a small token to show how thankful I am. ENJOY & thanks again for doing business with me!!! BTW, this creation also qualifies for my blogging challenge to make something fall themed! Yaay, me LOL!!! Well, I'm off to get ready for an extremely busy day! Thanks so much for stopping by & have a great rest of the weekend!!! This is so pretty, love how you did the leaves and the sentiment, is that in a large button? Love it. Have a wonderful weekend. You have really been on a roll with all that new stuff. This is so adorable. I love the little acorn at the top of the card as an accent! Great Job. absolutely gorgeous!!! love the paper! Fabulous design, Jackie. Love the combination of elements, colors, and DSP. Enjoy your weekend! Very cute button! I love the acorn & leave too! Pretty card, very elegant and the papers are lovely. 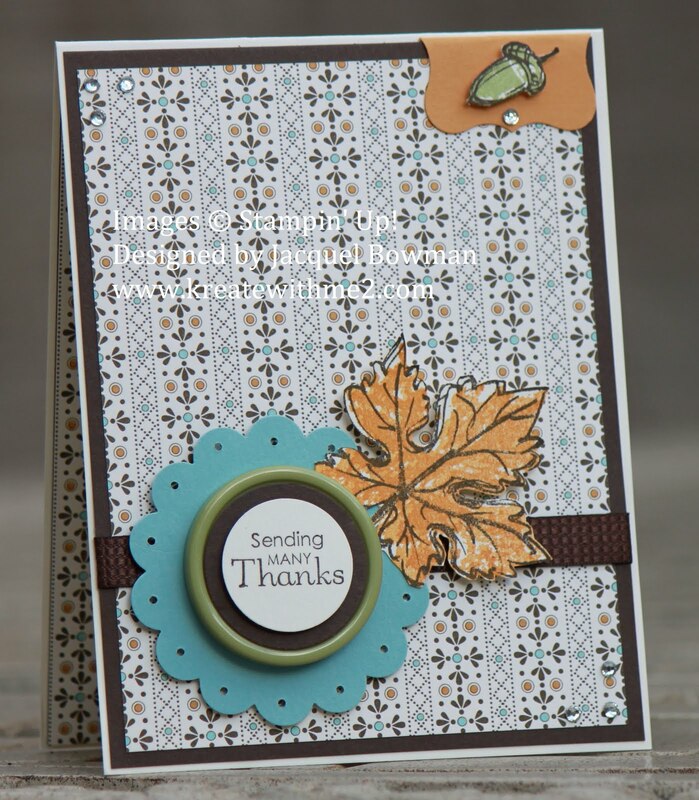 Ooooh, what gorgeous papers, Jackie, and the addition of the leaf and acorn give this a beautiul, elegant fall look!!! What a beautiful card with all the perfect shades of Fall. GREAT card Jackie! I just love the little acorn in the corner with the pop of sparkle. and what a cool way to use the button! Clever!! Jackie, this is beautiful! I LOVE the button! Wonderful idea!! Oh these colors are so pretty together! The leaf and acorn detail are perfect. Pretty card, I like that paper. Your card is a reminder that fall is just around the corner. What a sweet SU rep. to send your customers thank you cards. What a beautiful card! I love the papers and the leaf. I love the paper piercing, and the use of the label punch over the top to secure the acorn and rinestone. Beautiful! Very nice! What a pretty card. Love the DP background, Jackie. The blue/ brown combo seems to be really hot right now and you showcased it beautifully! Good job! That button under the greeting is too cute. What a fantastic idea. Beautiful card!! Oh Miss Jackie, this is a stunning card - I love the rich colors and the elegance of the layout! It just makes me feel the crisp in the air of Fall by looking at it - absolutley beautiful work, my friend! TFS!! This is so lovely, Jackie, and so sweet of you to send them to your customers. I love those colours paired with the dp, really beautiful combo! How sweet and thoughtful to send your customers a thank you card. It's beautiful, I love the leaf and acorn. Oh, very nice. Did you use Spice Cake? I love that DSP. Very pretty card. Lovely card I just adore the well placed crystals and the acorn up the top especially. Lovely papers too. Beautiful card, Jackie! Love the arrangement. Jackie this card is lovely! I especially like the blue scallop circle with the "thank you" sentiment on top. The patterned paper is beautiful! Wow, Jackie, this is really pretty. I love the colors, perfect for fall. Lovely card, Jackie! This paper is really pretty; I love the bits of Baja Breeze and your scalloped circle really brings the color out. Awesome coloring on the leaf, and the acorn in the corner is so cute! Great job, as always! Jackie, this is awesome! Love the colors you chose for this card. This is awesome! What a super design. Great fall card. I love how you used the leaf to accent your "button" sentiment. I love this card Jackie!